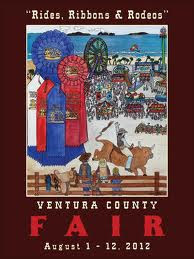 Off Wellman Way: Ventura County Fair 2012 - I Never Thought? What an absolutely wonderful day! 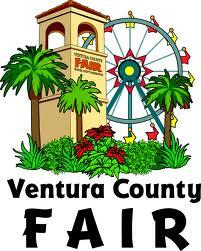 We went to the Ventura County Fair. Most of my family was there and most of Hannah's cousins, even from as far away as Oklahoma City! And ... even the ones that live next door to me. 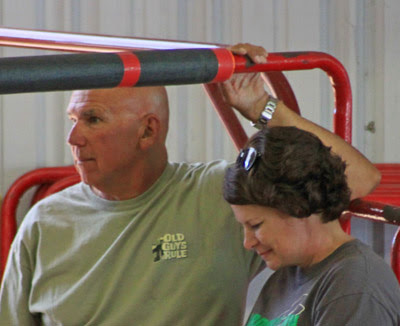 We all did the ol' trip to the County Fair that has been a tradition in, at least my life, for over 50 years. I've been actively involved until just 3 years ago. and I worked as a project advisor for 32 years. I can't believe it when I add even Tressa's days over at the Fair. 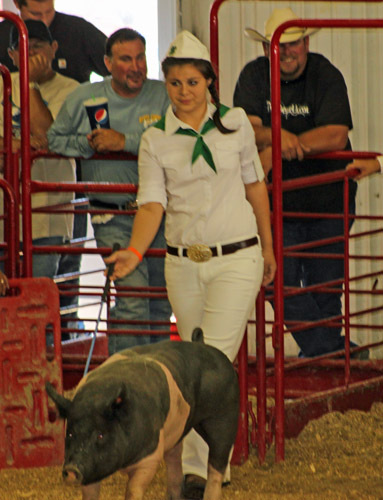 And in just a "little hop" in time, here's her daughter, my grand daughter, Hannah, showing her pig. He's a barrow, named Spunky. 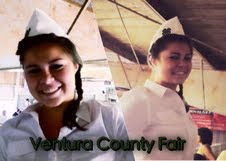 Tressa and her family ... Mike and Jake, along with Hannah, are active participants working at the fair. They've been using the pig-boards, helping others, and generally trying to give their time to help our super Livestock Chairman, Chris Garmon and the Pig Chairman, Patrick Maynard have an easier job. 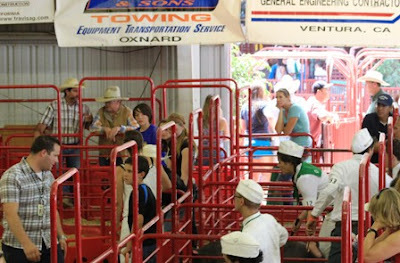 How is it at the campground for the Large Livestock participants? Heaven! They are camping right on the beach with campfires, front row seats for the fireworks, and when the work is done a great dip in the ocean is the stress-reliever and a now even a new shower for the campers. It was just installed with the new, huge barn. The temperatures here have been really hot, but in the gigantic barn that was made for comfort. The temperature was incredible, at only 75 degrees. There's computers all over the show-ring and the layout in the barn to the showing area has super, easy access for all breeds was designed so well. It seems all so perfect, really wonderful that my grand daughter is able to experience this newness and with such less stress for all involved the 4Hers, FFA, and Grange. We had pigs when we were young. I can remember the horse's panic when the piglets ran through the pasture and the horses reacted by killing most of them. We did raise them on and off. Mostly off. My nephews had them downwind on the ranch and we had some rescue pigs and also raised pigs for Hannah's parents wedding. Hannah's Tongan family did a deep-pit B-B-Q and "Oh yeah" pigs where meant to eat. If you've read my blog before on animals, you know pigs bite me. I hate to be the one who administers the shots, they always remember me and bite my ankles. We don't get along, but Spunky likes love pats, even from me. Hannah did great and I mean really great at showing her pig in the judging class. 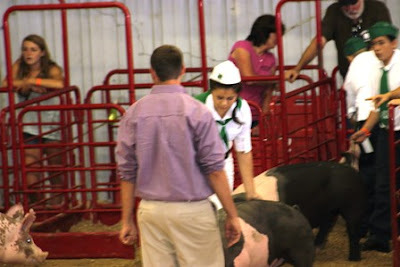 Her placing was either 3rd or 4th and the judge said her pig needed more finish. Twenty more pounds to the 266 and that she weighed-in at the first day would have done it and the other was that Spunky's feet weren't tracking well. Spunky had been laying down and completely relaxed and asleep before class, but his feet were asleep when Hannah took him to the Pavilion for judging. Out of the chute, he was just slightly dragging his back feet. I can see that Hannah had a good eye for what the judge wanted. She picked a great pig and I'm so proud of her for seeing the qualities that can produce a champion. 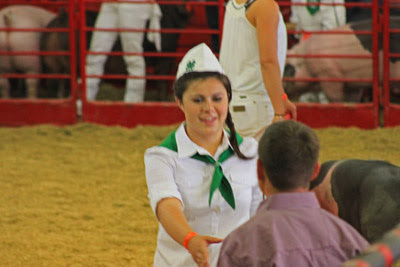 There were 332 pigs, so I'm so amazed at her achievement. Fair is "fair" when all we want for our children and grandchildren to accomplish in a year that was better than the last. So, this was a great success. Our family was a super rooting section. Wait...cheering section. Rooting/pigs lol. Pigs are great project animals and I know that Spunky will very much bless a family. So much of our fair animals go to "Food Share." 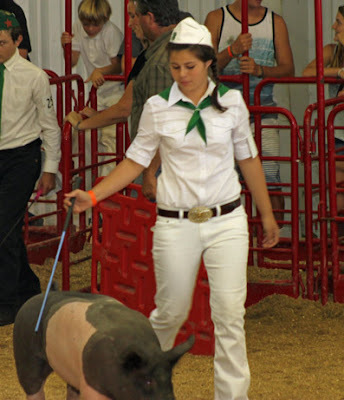 My grand daughter didn't practice much with her pig and showing, but calmly talked to him throughout the time she raised him, I think she washed him everyday and applied make-up. The make-up is fabricated, but he was loved so much. She talked and encouraged Spunky just same as he walked-up for judging and told him what a wonderful pig he was, like a "pig whisperer" will do. The pig hit the sawdust and instead of taking-off running, he stood and posed right in front of the judge with his head high and his legs set-up. 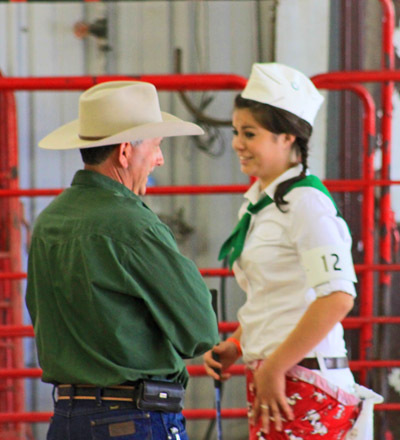 Hannah didn't have a bit of trouble keeping in close proximity to the judge and did "figure-eights" with ease, she even smiled and kept showing, even when she was penned. Yay! 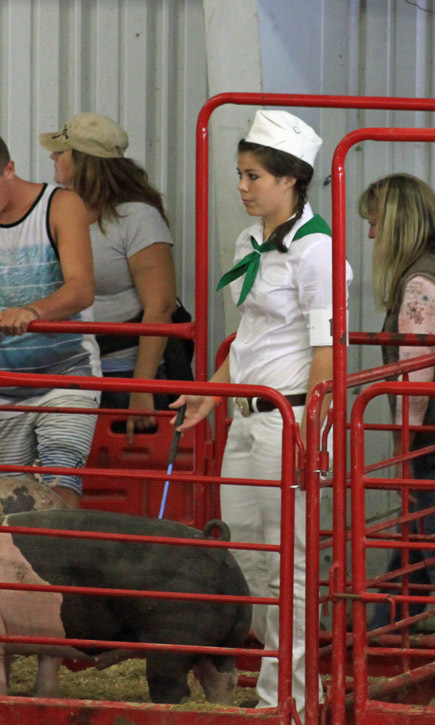 Hannah was penned with her pig. Hannah and Spunky Were Penned, Yay! This is a fair I won't forget. Spunky was a VERY GOOD pig, just like "Wilbur" in the book, Charlotte's Web and he knows it. We will all remember her, but we need to get home. It's hotter than ever, just 20 miles inland from the ocean.